So if the standard GMC Terrain isn’t enough for you, than you may be in luck. The latest spy photos have shed light that there is a glitzier Denali version on the way. Expect the 2012 Terrain Denali to look much shinier by the time it hits dealerships than what we see in the picture. For more, head to Cheers and Gears. I bet the grille will be chrome. I wonder why they have to test a vehicle with every minor part they replace? If it’s a matter of airflow, they do have wind tunnels for that. Or they will offer a V8 in a Terrain? A V12! Maybe the Terrain Denali will be one of the first vehicles — besides the revised SRX — to get GM’s new LFX V6?! This may not be a true Denali edition. Could just be an updating/changing of the grill, from the current “window air conditioner” look, with a few other tweaks & enhancements. If this is a Denali. I hope it’s more than just an optioned out vehicle, with some extra chrome bits. It does need some sort of suspension and engine upgrades. IMO – The Acadia Denali is just a fiasco, when you take into account the price, and what you really get (and don’t). “Windows air conditioner.” Love it! 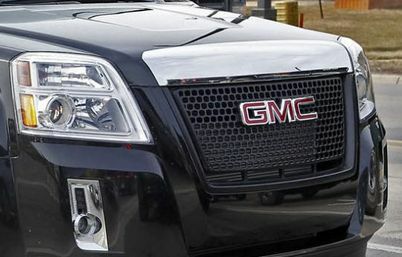 But I completely agree with you — the Denali name must go way above and beyond a fully-loaded GMC with some chrome sprinkled in… it must have some more distinctive materials and powertrains — in my opinion.